The mission of the Science and Technology (S&T) Division is to ensure that Army Special Operations Forces (ARSOF) maintain a decisive technological advantage on the battlefield by maximizing the use of external S&T resources to fill ARSOF S&T Gaps. S&T investment is required to ensure ARSOF operators of the future have the most advanced capabilities to conduct Special Operations campaigns. Emerging Technology white papers and proposals are examined to determine if the technology addresses a USASOC S&T Gap (S&T Gaps are not currently releasable). The Technology Assessment begins when information about a technology which does meet an S&T Gap is sent to a DoD lab for technical review. Pending the technical review, a USASOC operator contacts the technology owner to define a Technology Assessment Plan which will consist of the appropriate level of demonstrations and experiments with the technology. USASOC formally Endorses successful technologies via a formal memorandum to the appropriate DoD lab for technical and financial investment for the technology. USASOC operators work directly with vendors of funded projects to ensure operator's needs are adequately addressed. 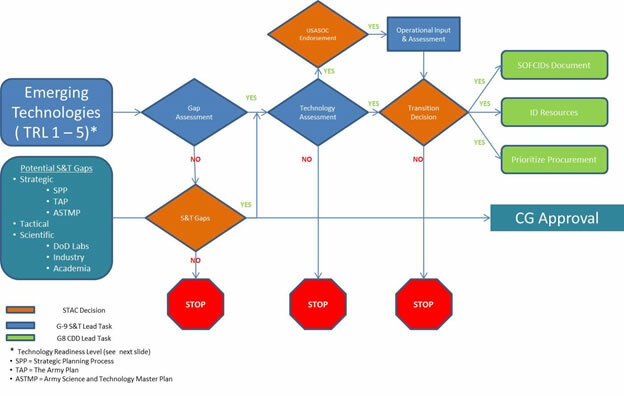 The S&T portion of a technologies development is complete when a favorable Transition Decision moves government leadership of the technology to the USASOC Combat Developments Directorate for entry to the requirements, development and procurement decisions. The process begins with technology white paper submissions to S_T.TAU@soc.mil.